Traditional craft of making jointless green glass bangles is prevalent in Unch village of the Nadbai block near Bharatpur, Rajasthan. RuTAG IIT Delhi interacted with the artisans engaged in this craft with the help of LUPIN foundation and identified problems with their furnace, seating posture during work and the tools they use. In this paper, the experience of developing solutions to these three problems has been discussed. A new furnace with commercial ceramic fibre insulation and a chimney-damper arrangement has solved the problem of hot and polluted working space and has also resulted in saving over 70% of the fuel they use in the furnace. Alternative seating arrangements proposed for the artisans were well-received by them. Modifications to their working tools also were appreciated by the artisans during the trials conducted. The furnace is in operation in the village. The other solutions need active promotion in the village before their effective adoption by artisans. 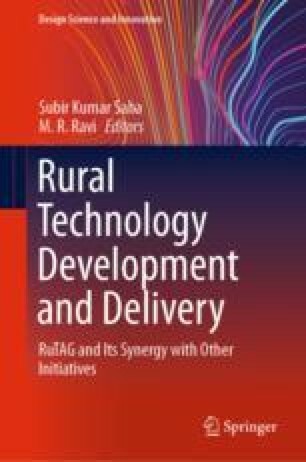 The authors sincerely thank the financial support from the Office of the Principal Scientific Advisor to the Government of India, Vigyan Bhawan New Delhi for its support to RuTAG (Rural Technology Action Group). The encouragement of Dr. Ketaki Bhapat (Scientist ‘F’), Maj. S. Chatterjee (Ex-Sr. Project Consultant), Prof. R. R. Gaur (Chairman, RuTAG IIT Delhi) is highly appreciated. Authors are thankful to B.Tech students at IIT Delhi (now alumni) Shrey Gulati, Aayush Bansal and Vineet Kumar for their contribution during various stages of the project. Authors are also thankful to the field agency Lupin Foundation, Bharatpur for support and feedback in the field level implementation.